The last six months or so, I have been in a minimalist slump. After my dissatisfaction with my summer capsule wardrobe, and feeling the siren call of consumerism, I have had a hard time keeping our lives really minimal. I have felt like a semi-failure/fake in the minimalist world. As the New Year approaches, I have been thinking about realigning my thoughts, and moving forward as a (practical) minimalist. A few unexpected sources appeared in the last week or so to inspire me to recommit to living more simply, and learning to love the place where I am at right now, while moving forward to an even better place. **For me minimalism goes hand in hand with living in a more environmentally conscious life, so several of these articles/books/documentaries talks about being eco-friendly as well. Sorry if that isn't your thing. 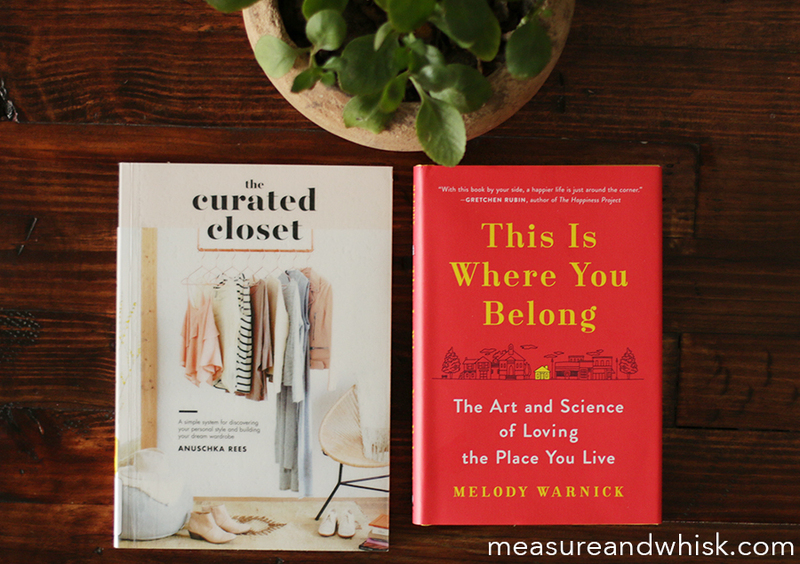 "The Curated Closet " Your closet is YOURS! Take control of it, and only keep things you love in it. You would think after so many years of being a clothes lover, you would think I would have this figured out. Sadly, I don't. I am working the plan form this book, and will report back to you in a few weeks with the results. I am currently documenting my outfit everyday, and will be hopefully clearning out my closet, and really learning what my style is (it is ever evolving, but I feel like I have been going in the wrong direction with it.). "This Is Where You Belong " My mom recommended this book, and then sent it to me for Christmas. I am not done with it yet, but I am loving it so far. It isn't about minimalism directly, but lines up a lot with some of my goals for living life. Basically, it is about a woman who feels like starting over in a new place will help her love it. As she moves to a new place, she decides she needs to change some of her habits in order to love the place she lives. Some of these new habits include walking in her neighborhood, volunteering, eating locally, shopping locally, etc. She talks about how you can love your city more by serving in it, getting to know your neighbors, contributing monetarily, etc. Definitely something I need to do better at. Wherever we end up next, I hope we can live in a more walk-friendly neighborhood. "Minimalism: a Documentary About the Important Things " I heard about this like 4 times from 4 different sources, in 3 days, and knew it sounded like something I would love watching. It is currently on Netflix, and I really enjoyed it. It didn't have anything particularly new in it, but was a good reminder of why I want to be a minimalist. The Great Outdoors article: Eating Right Can Save the World - This was a fascinating article. Again, it wasn't really anything new, mostly it was about how changing what you eat can affect your environmental footprint, you should eat local, and organic. Adam randomly brought home this article in a magazine from the library, and I really enjoyed it. I thought he made some interesting and good points about why we should make some different food choices. Yet another kick in the pants to get me going for the new year. Hopefully this will help kickstart your New Year, too! Hooray for a chance to start fresh! I love the idea of practical minimalism. True minimalism just doesn't work for me or the stage of life I'm in (with a small toddler), and in a lot of ways it's not something I actually aspire to. But I also don't want to end up with tons and tons of stuff bogging me down, so thinking of myself as aspiring to minimalism helps me keep my consumer tendencies under control. I feel like I've read all these articles where people say they got rid of a ton of stuff or were in a situation without their stuff for a while and they all say they realized they didn't miss it at all. And I kind of went, really?? We moved to China three and half years ago (and moved back to the US just a few months ago) and there were many many times I missed my stuff in the US. I missed kitchen appliances that didn't necessarily see regular use, I missed clothes I'd left behind, I missed decorations we had. I like my stuff. I mean, I didn't miss all of it, and when we came back we threw out a ton. But I think there's a balance to be found - I feel like we're missing a word here. Something that describes the place between true minimalism and drowning in your stuff. What's that place called?! That's where I want to be. We call this place between minimalism and drowning in stuff, "Everyday Simple"...consciously choosing what we live with that will make our lives more joyful and more simple. It means owning a few more things in some areas (kitchen appliances? clothes?) and less in other areas (toys? electronic gadgets?). Being a conscience consumer, choosing quality over quantity, choosing to spend a bit more in order to buy from ethical and sustainable sources. "Everyday Simple" will have a different definition for each person/family. My difficulty is what can only be described as confusion when I see big houses. Is this what my generation is supposed to want? We are small house fans over here, too. Big houses just don't appeal to me that much anymore. I keep thinking of how many bathrooms I would have to clean, and floors I would have to vacuum. I wouldn't have time to do anything else!